At the end of each year I set goals for the new year, and review the goals I set for the year just completed. For 2018 I planned on doing six walks of 100 miles or more, and I ended up doing five. But of the six events I was planning on doing this time last year, I actually only did two. I started off the year with a foot injury (a bursa on the bottom of my left foot which made it very uncomfortable to walk) and as a result I took all of January off, other than 29km on New Year’s day. When I started back training I did some moderate mileage during the first three weeks of February and then got sick, so it wasn’t until mid-March that I actually resumed proper training. This meant that I didn’t do my first race of 2018, which was going to be the Belfast to Dublin Ultra. I was keen to do this after finishing 4th overall and first/only walker in the Dublin to Belfast equivalent of this race in 2017 but I wasn’t fit enough to consider walking for 24+ hours at the end of March. I also decided that I wouldn’t be able to get fit enough to compete in the EMU six day race in Hungary in the first week of May either, so decided to revisit my plans. 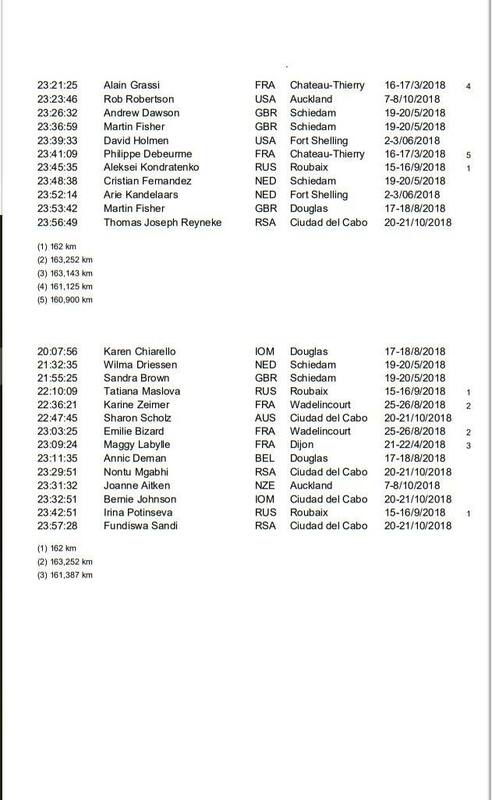 I decided to replace the six day race with a 24 hour race in Dijon, France on the 21st April for my first race of 2018, which also happened to be the French National Championships, and also to go to Schiedam, Holland in mid-May for the Continental Centurions Race. And I had two great results – a 5th place overall in Dijon in extremely hot conditions, and then two NZ records (100 miles and 24 hours) in Schiedam. I was now in to full training and turned up at Last One Standing, England in the second weekend of June full of confidence. Last One Standing is an elimination race in which runners (plus me as a walker) have one hour to complete a 4.1 mile (6.5km) mostly off-road loop in under an hour and be back on the start line for the next loop at the start of the next hour. The winner was the person who could complete the most loops without being eliminated (failing to finish a lap in under an hour or failing to start the next lap) and I was confident that I had more endurance than anyone else in the field – and so it was. It took me 36 hours but I outlasted all the runners to win the race. Last One Standing was my first planned race of 2018 and 6 jours de France in mid-August was the second and last of the six events from my original 2018 plan that I actually did. If I was to give the race a grading, it would probably be a C. I didn’t achieve the result I was after, but it wasn’t as bad as 2017 either. My original plan was to go back to one of my favourite races in September, the Roubaix 28 hour race, but I felt I needed more time to recover after the 6 day, and my last event for 2018 was going to be a charity fundraising walk from Paris to London which I had hoped to do in October, but I couldn’t face the effort of planning an event like that, and also wasn’t too keen on doing another multi-day walk. So instead, I decided to do a 48 hour race in Royan which I figured I could complete without any sleep, and whilst the race didn’t have walking judges, I thought I could still set a decent distance for 48 hours as a PB and NZ best – my official NZ record being 241km from the first 48 hours of the 6 jours de France this year, and my PB being 254km from when I walked around the outside of the M25 motorway in 2017. Unfortunately the weather was shocking for much of the race but I managed to win the race with a satisfactory distance of 278km to complete my year. Overall, I would give my year a grade of B. I had three wins from five races and improved my NZ records for 100 miles, 24 hours and 48 hours, and also set an NZ M50 age group record for 500km and 6 days. Total mileage: 2,266 miles (3,646 km) – 107 miles less than 2017. Total mileage during races: 892 miles (1,436km) – 39% of total mileage. This was 91 miles less than 2017 but almost the same percentage of overall mileage (41% in 2017). Total raised for charity: £1,362 – whilst I didn’t do a charity walk myself in 2018, I organised a walkathon for the local scout group for the second year in a row, and have been invited to organise a third walkathon which will be in June 2019. 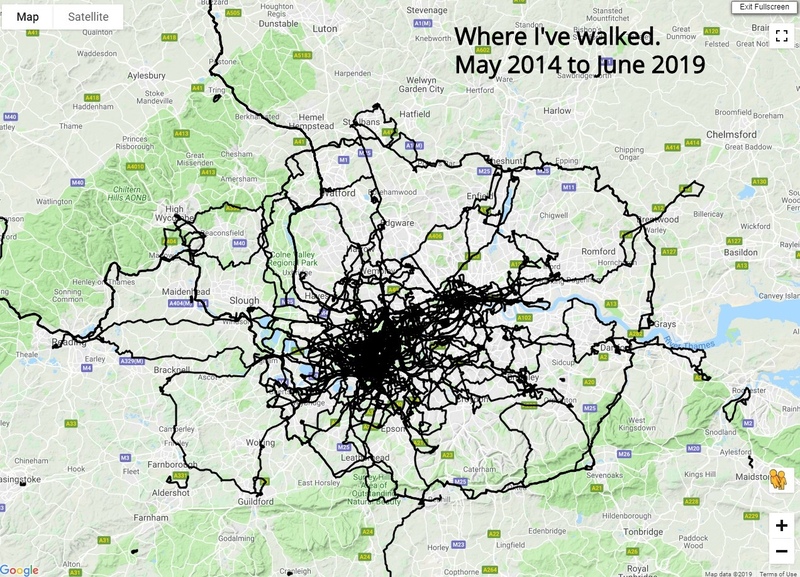 The blue lines show the new places I walked during 2018. The red and blue combine to show where I have walked since May 2014. There are so many races to choose from, and it would be very easy to over-race if I wasn’t disciplined. Right now, rather than choosing too many races I am not really committing to much at all during 2019. I would like to do at least as many 100 mile+ races as I have in recent years (5 in 2018, 6 in 2017, 4 in 2016 and 5 in 2015) but at the moment the only two that are definitely on my list are the Belfast-Dublin-Belfast 214 mile (346km) ultra at the end of March, and Last One Standing, England on the second weekend of June. The Last One Standing race is the more important of the two. If I can win this again, the prize in 2019 in an entry into Big’s Back Yard in the USA – the unofficial world championship of this type of racing. In 2018 it took 66 hours before a winner was decided at Big’s Back Yard. It only took 36 hours for me to win Last One Standing, England this year but after winning the Royan 48 hour race without any sleep, and effectively being awake for 65 hours, I feel that I can probably last 48 to 50 hours, and maybe more. I would like to find out. And with that in mind, I am very tempted to treat the Belfast-Dublin-Belfast ultra as a warm-up for Last One Standing, and walk 55 minutes, rest 5 minutes, throughout the whole race. I would also like to complete Belfast-Dublin-Belfast in under 55 hours – which means walking 300km in the first 48 hours – a nice round number target. If I can win Last One Standing, England, then I’ll be competing at Big’s Back Yard ultra in October, and that will be my ‘A’ race for 2019. But let’s just wait and see what happens. I have had plenty of support from many people during 2018. So a big thank you to everyone and especially from the companies who have helped me financially and with product – Fitbit and Strictly Banners. Today is the 1st of April and after struggling with injury for the last six months, I’m back training again and looking forward to a huge summer. After missing the Belfast to Dublin Ultra this weekend, I’ve spent this afternoon making new plans for 2018. My main focus of 2018 is still the Privas 6 day race in August, but I’ve changed some of my plans for the rest of the year. I won’t be doing the EMU 6 day race in Hungary in May as I can’t get fit enough over the next 4 weeks to do that race justice, and it is too expensive to use as a ‘training race’. The EMU was going to be a major part of my preparations for Privas though, so rather than doing EMU, I will bring forward my Paris to London fundraising walk for Limbless Association forward and do that in July rather than October. 21/22 April – French national 24 hour championship race in Dijon. This will be a training race with the aim of covering 100 miles in 24 hours at a steady pace. I just want to spend 24 hours on my feet as I haven’t walked 24 hours since Roubaix in September last year. 19/20 May – Continental Centurions Race in Schiedam, Holland. This is on a fast, almost dead flat 4km circuit in the trees within Prinses Beatrixpark in Schiedam near Rotterdam. I set my current 100 mile and 24 hour PB’s at Schiedam in 2016 and this will be my first serious attempt at racing a 24 hour race since then. 9/10 June – Last One Standing UK race as planned. I’m really looking forward to this race. The idea is that competitors have to run (or in my case walk) a 4 mile loop every hour, starting on the hour. If you don’t finish within the hour, you are out. The winner is “the last one standing”. I thought this might be a bit of fun and good training, and I think that I can perform well against the runners in this event. 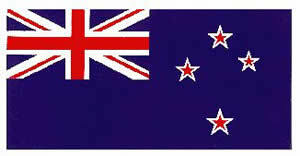 I’m not competing but am organising a walkathon for the local scout group. Last year they raised £2,250. This year we are hoping to exceed that. I’m really looking forward to this and will use this as my final preparation for Privas which is 6 weeks later. 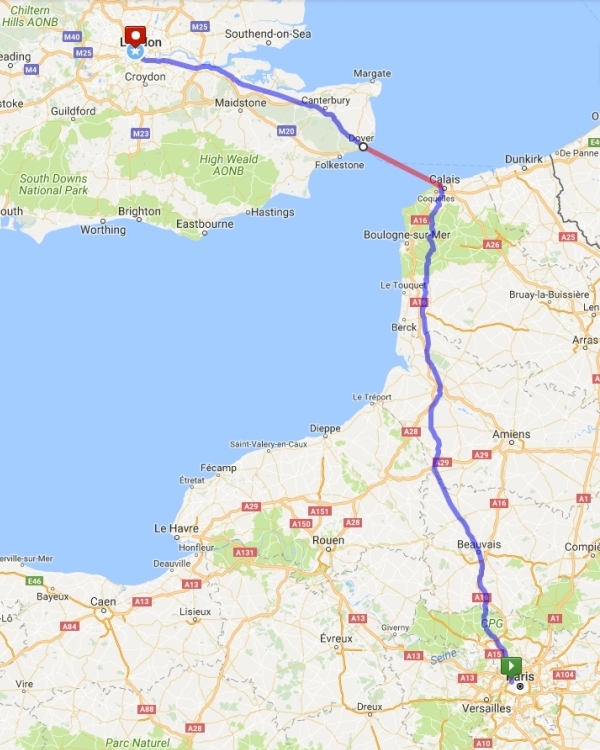 I’ve mapped out a course which is roughly 400km in total (or at least it will be when I add ‘getting lost’ miles to the planned route) with 270km in France, a short ferry ride form Calais to Dover, and then another 126km through to London. 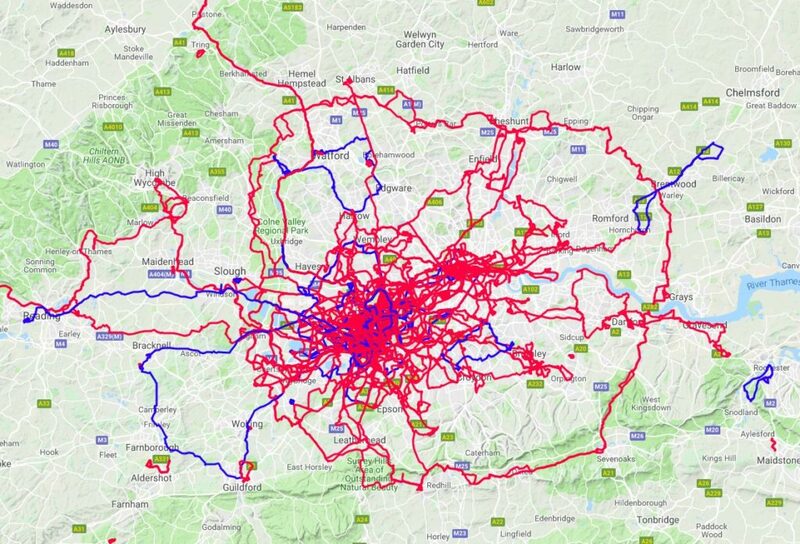 I have had a look at the routes that other people have run or cycled between these two cities. They usually go from London to Paris and they either start at Marble Arch and finish at Arc de Triomphe, or they start at Tower Bridge and finish at the Eifel Tower. I’ve decided that I will start at Eifel Tower and then go past the Arc de Triomphe on the way out of Paris, and will cross Tower Bridge on my way in to London before finishing at Marble Arch. I’ve chosen to go from Paris to London rather than vice versa as I would prefer to be on roads that I am more familiar with during the final day (and a bit). 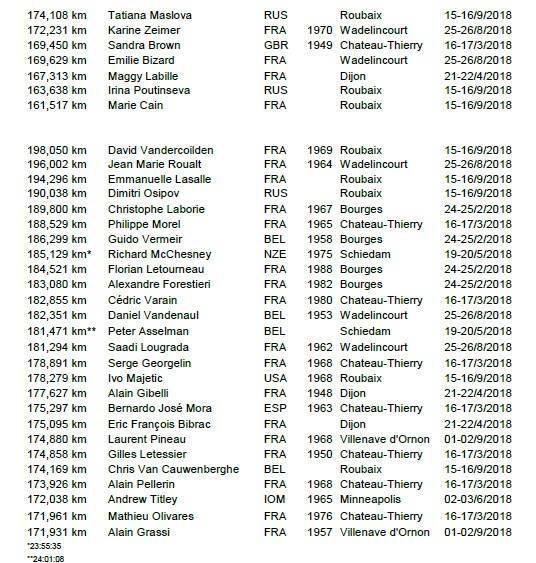 I’m going to take 4 days to cover the distance at 100km per day which is a little less than the distance I will aim to cover during the first four days at Privas, but will be great training for the race. My third attempt to break the NZ 6 day record after going close in 2016 and failing miserably in 2017. My goal is still to exceed 700km during the six days. I’ve done this three times with two 200+ kilometer results (2015 and 2017) and will probably finish my year this race again. I was hoping to do this in Bourges in March but after becoming sick in mid-January due to too much training in extremely cold early morning air, I decided not to race Bourges, and in the end I didn’t do a 24 hour race at all in 2017. 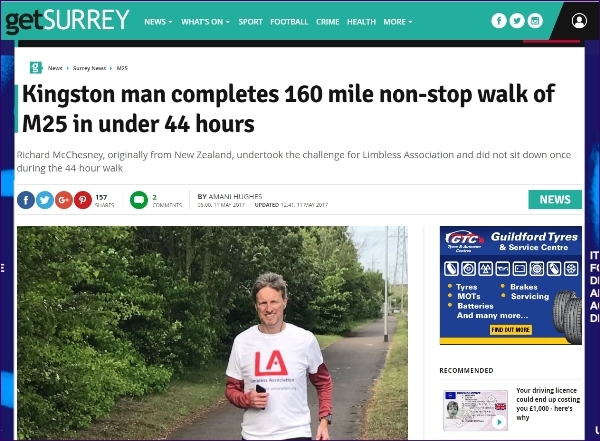 I had attempted this in 2016 and failed to complete the approximately 160 mile loop around greater London non-stop. So this was one of my three goals for 2017 and on the first weekend in May I exceeded my expectations by completing the circuit in a shade under 44 hours. Not only that, but I didn’t sit down from the time I started until the time I finished! 44 hours on my feet. And I raised £1,902 for Limbless Association, a very worthwhile charity. This was definitely my biggest achievement of 2017 and something I am extremely proud of. In my second 6 day race I wanted to improve on the 614km I walked in 2016 and believed that I could possibly even walk as far as 700km. Well I made 71% of that distance. I had a terrible race. I was mentally weak and in a race of that distance it is more about mental strength than physical. I still believe I can exceed 700km and will be attempting the distance again in 2018. So based on that, 2017 wasn’t a great year. I only met one of my three goals. But on the positive side, my M25 walk raised £1,902 for Limbless Association, and I also organised a fundraising walkathon for the local scout group in which 56 scouts walked laps of the local common for three hours and raised £2,250 between them. This event was so successful that they have invited me back to organise a second walkathon in 2018. Regarding the 24 hour record attempt, I made the decision not to walk a 24 hour race, so I can’t be disappointed that I didn’t reach that goal. 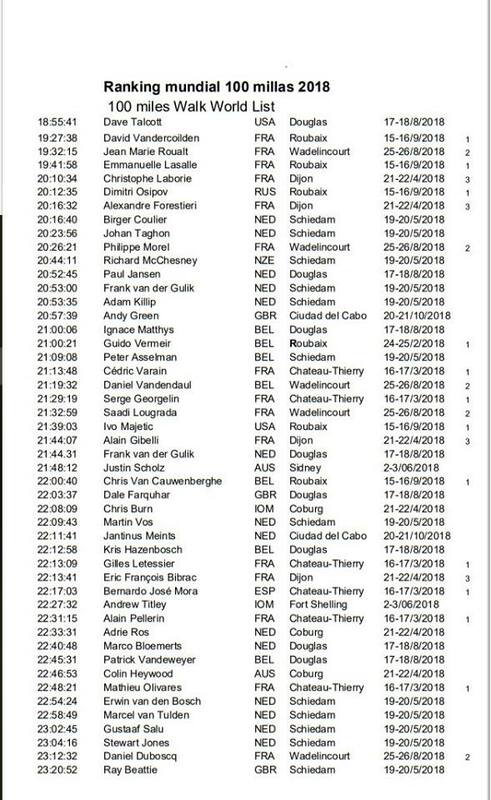 And whilst I only managed 500km in the 6 day race in August, I used that experience to bounce back and have a great race at Roubaix over 28 hours just three weeks later. If I had ‘raced’ the event rather than starting slow, I could have gone further and probably beaten my NZ 200km record in the process. I also placed 4th overall (and only walker) in the Dublin to Belfast Ultra in April, walking my way through the field after being in last place at 15 miles. Two races that didn’t go so well though, were the Grand Union Canal Race in May in which I DNF’d at 100 miles in May, and then I dropped out of my first (and probably only) Thames Ring 250 at 132 miles the following month. And now, at the end of 2017, I am unable to walk without pain due to a foot injury that is getting worse because I tried to ignore it for the last few months. At some stage around the time of the Roubaix race in September I noticed that I had a little lump under the ball of my left foot. It wasn’t too bad and didn’t hurt when I was walking, but it was uncomfortable and over time I noticed that I had minor pain/discomfort in the top of my left foot which I thought might be related. To cut a long story short, it appears that the lump might be a bursa (a small balloon of fluid) and whilst it still doesn’t hurt to walk on, I have sub-consciously changed my foot placement to avoid putting too much weight on the ball of my foot, and now have a painful/inflamed arch. This means that 2018 will begin with a month of complete rest and a visit to a foot surgeon in mid-January. Total mileage during races: 983 miles (1,581km) – 41% of total mileage. I am not entering any races until I know how long my foot will take to come right, but all going well, I have six events of 100 miles or more planned for 2018 including a big walk to race more money for Limbless Association at the end of the summer. And I will also be organising the scouts walkathon again in May. The reverse of the Dublin to Belfast Ultra in which I finished fourth overall in 2017. Whilst this is a 6 day race and the course is much better than Privas, and therefore should result in a greater distance, there are no race-walking judges meaning that results are ‘unofficial’ for record purposes. That said, there will be several very competitive race-walkers at the race and I would love to be there. I also want to use this race to test out a new sleeping strategy that I have in mind for the Privas 6 day race in August. I love the concept of this race. The idea is that competitors have to run (or in my case walk) a 4 mile loop every hour, starting on the hour. If you don’t finish within the hour, you are out. The winner is “the last man standing”. I thought this might be a bit of fun and good training, and I think that I can perform well against the runners in this event. My third attempt to break the NZ 6 day record after going close in 2016 and failing miserably in 2017. My goal will be to exceed 700km during the six days. I’ve done this three times with two 200+ kilometer results (2015 and 2017). 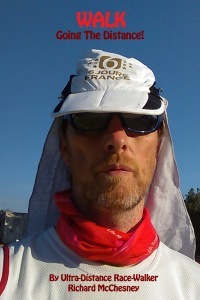 In 2015 I did my first charity fundraising walk when I did the 72 hour race in Privas. In 2016 I used my first attempt at circumnavigating the M25 as my second charity fundraiser, and in 2017 I again used my M25 circumnavigation to raise money for charity. In 2017 the charity I selected was Limbless Association as I wanted to use my arms and legs to raise money for a charity that supports people who are missing one or more arms or legs. Limbless Association supported me during the walk as well with Joel, their fundraising manager, acting as my support crew for the first and last 8 hours of the walk. In 2018 I intend to support Limbless Association again and attempt my biggest adventure to date – walking from Paris to London, or to be more specific, from Arc de Triomphe in Paris to Marble Arch in London. Depending on the route I take, it will be somewhere between 385 and 430km of walking plus a ferry ride. 265 and 290km (165 to 180 miles) from Paris to Calais and another 120 to 140km (75 to 87 miles) from Dover to Marble Arch. 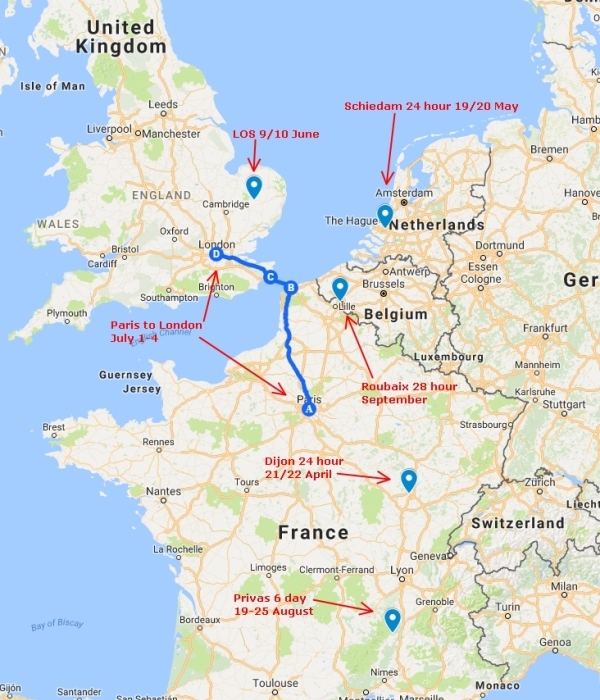 I would like to try and complete this in under 72 hours with one short sleep half way between Paris and Calais and another while waiting for the ferry and during the sailing to Dover, but suspect that it is more likely to take somewhere between 80 and 90 hours, or maybe longer. I have had plenty of support from many people during 2017. So a big thank you to everyone and especially from the companies who have helped me financially and with product – Fitbit, Beta Running (Injinji and Ultimate Direction) and Strictly Banners.